I have an obsession with pies and tarts, call them as you wish. The moist filling, full of fruits or berries or a mixture of both. I love everything about pie – making the dough, the process of putting it together, and the result the most. Pie-baking gives such freedom – because pie likes everything, from sweet to savoury, and although they say (some of the British bake-off judges) there is nothing worse than a soggy bottom, I just love that in a pie. This baby came out after 2 months of looking at that jar of preserved peaches. 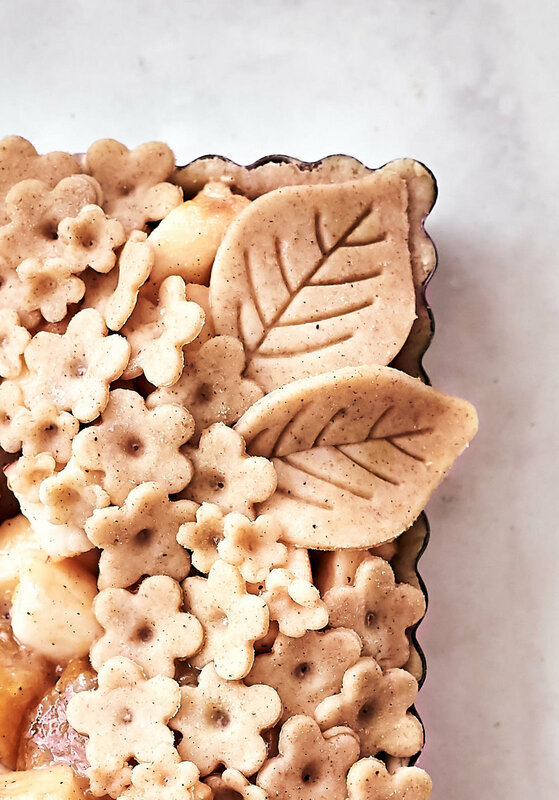 We’re not big preserved fruit lovers when it comes to eating them, just like that, but, standing next to that box of apples, the peaches just screamed to be cooked into a moist pie. And I did. Prepare the tart shell. In a bowl, pour the flours, sugar, salt, ginger powder, and if using, vanilla powder. Grate the butter on a course grater into the flour. Rub the butter into the flour mixture with your fingers until it resembles course breadcrumbs. You can also prepare the dough in a food processor with the fine blade – add all the ingredients and process on medium speed until crumbly. Then add the milk, and if using, vanilla paste, and mix lightly until a smooth dough forms, but do not over-knead or the piecrust will not be crumbly, but hard. Wrap the dough in cling film and refrigerate for 30 minutes. Roll out the dough and place in a tart form (I used a 10 cm x 35-40cm pan), pressing the sides and them trimming of the dough that overlaps the pan. Prick with a fork. Place in the freezer for 15-20 minutes. Prepare the filling by adding all the ingredients in a bowl, and mixing them nicely. 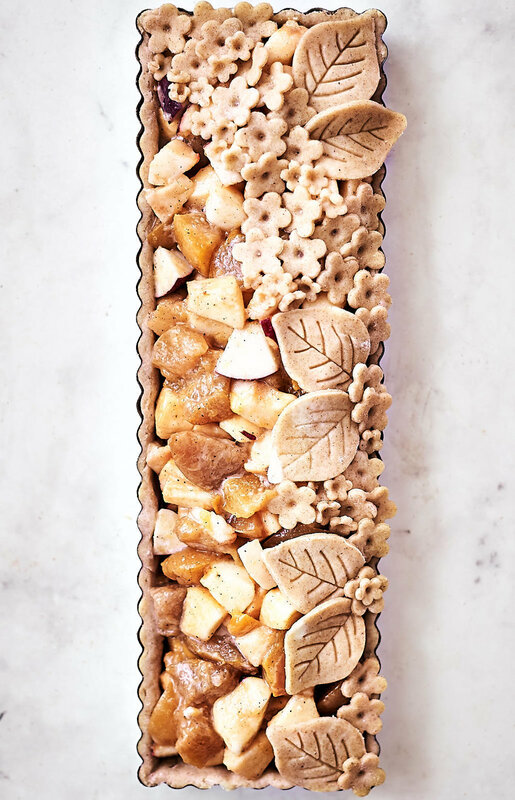 While the dough is in the freezer, roll out the remaining dough, cut different shapes and patterns, that you will use for decorating. Heat the oven to 200°. 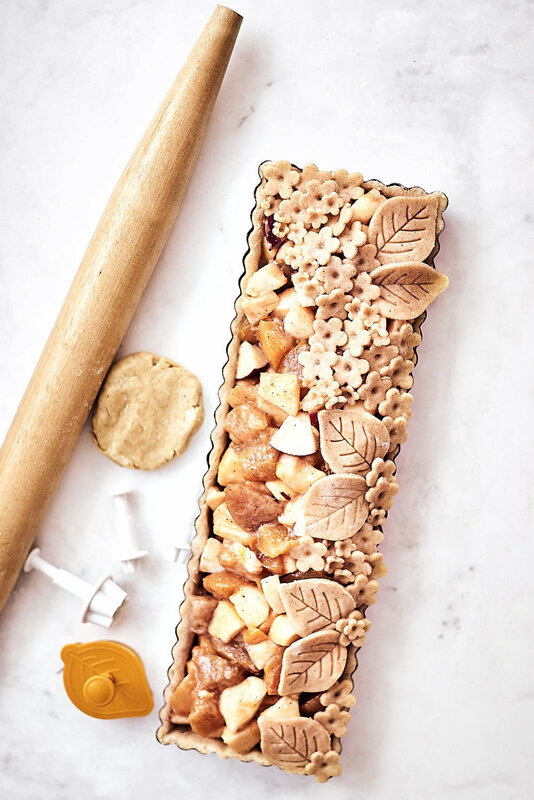 Take the pan out of the freezer, add the filling, so that it is almost 1 cm higher than the edge of the pan and decorate with the cut out leaves, flowers or any shape that makes you happy. * Because I like my filling semi-sweet, I use only 100 g sugar, but you can add more, if desired. The sweetness of the apples and peaches need to be considered. ** Vanilla ice cream goes really well with this tart.